Most of the traditions I associate with Easter stem from my Polish heritage. As I've gotten older, so has the desire to learn more about the culture and history that is a part of me - and share that with my children. "Historically a Polish and Polish-American tradition, Dyngus Day celebrates the end of the often restrictive observance of lent and the joy of Easter. Many Polish customs date back to pre-Christian practices of our Slavic ancestors. The custom of pouring water is an ancient spring rite of cleansing, purification, and fertility. The same is true of the complimentary practice. Tradition states that Prince Mieszko I along with his court was baptized on Easter Monday. Thus, Dyngus Day and its rites of sprinkling with water have become a folk celebration in thanksgiving for the fact that the first king of Poland was baptized into Christianity, bringing Catholicism to Poland. 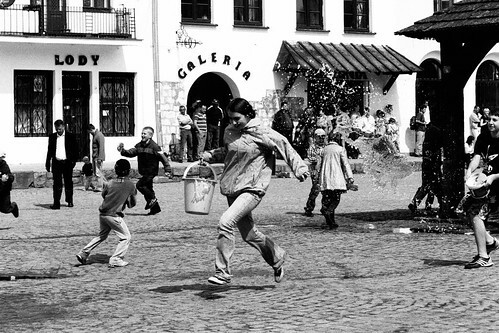 Nowadays - the holiday is more of a day long water fight, with no rules as to who throws sprinkles water on who. I'm guessing throwing (and I'm assuming breaking) "dishes and crockery" could get expensive, and would probably hurt if you were on the receiving end. Getting some water toys this weekend and hoping for warm weather on Monday so that we can participate! Have any of you ever participated in Dyngus Day activities? What Easter traditions stem from your heritage? JDaniel would loved to celebrate this holiday!